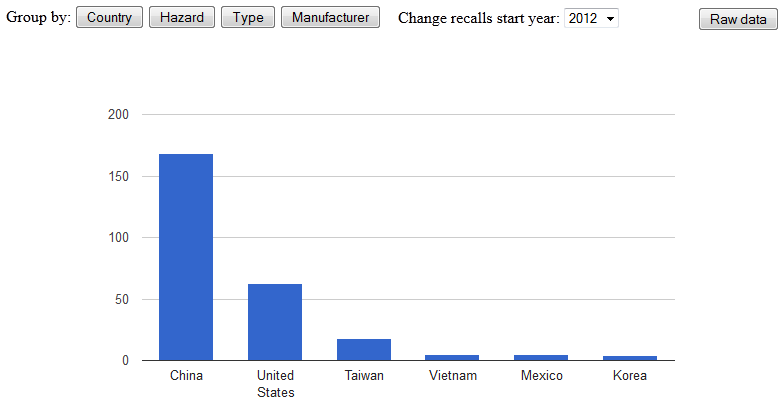 The Consumer Product Safety Commission (http://www.cpsc.gov/) collects and publishes information about product recalls. The department made its database of recalls information available to the public as a web service, which means we can have fun with this data… Leveraging our html5 dashboarding framework, I created a dashboard that consumes the web service (allows user to select start year for the recalls data) and aggregates the number of recalls based on user selected attributes (like country or manufacturer). The chart display shows categories that had 4 or more recalls in the selected time frame, the Raw Data view dumps the entire data set on the screen. This is interesting stuff.. Enjoy! This entry was posted in BI At Large, Data visualization, HTML5 and tagged Consumer Product Safety Commission, cpsc dashboard html5, visualize product recall data. Bookmark the permalink.